New China Glaze Holiday Joy 2012 Collection & Gift Sets! Its almost that time of year! Everyone is starting to think about gifts! I am SOO excited and this is a great time to start displaying retail items that are perfect for gifting! 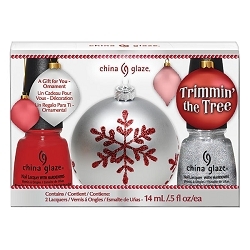 China glaze has come out with their Holiday Joy 2012 Collection along with a few super cute gift sets! The China Glaze Holiday Joy 2012 Collection Counter Display comes along with 2 each of the 12 new festive colors! Each of the 3 holiday gift sets include two or three polish colors and a gift! You can have your clients nails twinkling like holiday lights with pizzazz or they can be toasting on New Years with Champagne Kisses! 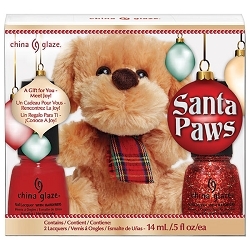 Includes one Red Satin Polish, one Pure Joy polish and the puppy stuffed animal names Joy! Includes one With Love polish, one Glistening Snow polish, and a festive tree ornament! Includes one Merry Berry, one Glistenng Snow, one Cranberry Splash, and a pair of cozy fingerless gloves!